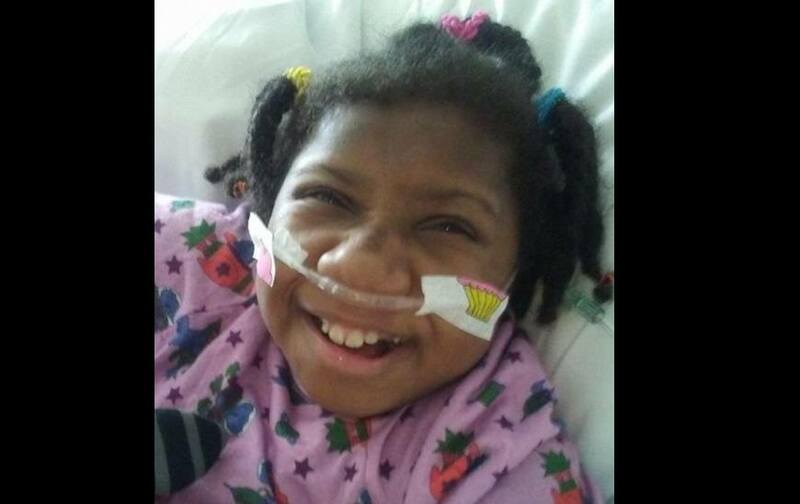 Nyhariah Mack's battle to live has ended. She passed away Thursday afternoon, December 7, 2017. The little girl with a very rare chromosomal disorder was full of life when a doctor and hospital enlisted Georgia's Child Protective Services to seize her from her mother a year and a half ago. At the time, she had no issues, just a rare medical condition that made her tiny and delayed her development. Shortly after going into "protective" custody, her health rapidly declined. She was subjected to unnecessary, experimental surgeries. Many family, friends, and supporters believe that the doctors and hospital at Emory took her in order to experiment on her, since her condition was so rare - only a little over a hundred people worldwide have the diagnosis of Trisomy 9. Her tonsils were removed only a couple of weeks after she was seized, providing tissue that scientists were free to use in experiments. What else might they have done to this little girl behind closed doors? It has been apparent to her mother since the beginning that there were some within this whole ordeal that saw her child as nothing more than a guinea pig, a lab rat to be used for scientific experimentation. Nhyariah is the latest casualty of this battle called Medical Kidnapping. This precious child is now in the loving arms of Jesus. She is loved, completely healed, vibrant and Happy. Her and her loving mother and family will be reunited one day, in Heaven. Peace be with mom. She told us many more lies, ending with her forcing my poor daughter out of her hospital bed and to the locked adult psych ward for "safe keeping" and calling security to "guard" her (from me!). This resident then insisted my daughter was in danger of suicide and especially if she went home with me. Of course after such an allegation is made by a "mandatory reporter" and in such a well respected world renown hospital such as Mayo, by a person identifying as a licensed child psychiatrist, she was "justified" in her treatment of me and daughter and in keeping her locked up on a psych unit while DHS launched a so-called investigation into me. All in "the best interest of the child." In the meantime daughter was then removed from Mayo and delivered to another hospital in another state, five states away from home. We were forbidden to see or talk to each other and I was constantly threatened with jail by DHS and new hospital if I tried. Her stem cells had been harvested a month prior to this and waiting at Mayo to be used in her upcoming highly anticipated life saving stem cell transplant to take place just 21 days from that last chemo she just had - 17 days from the day she was shipped from that locked adult psych ward to another state without my knowledge and consent. They had told her lies for the four days they had her locked up that I had left her there and they could not reach me, then that I would not return calls and then that I was not interested and did not care or want her, which was also carried on by the next hospital she was forced to in another state. None of her medical team had been consulted at any time (psych ward told me the med team was monitoring her) and did not realize she had been taken until later on - as told to me by daughter's head cancer doc. She was not getting her labs done and recorded or monitored by her cancer docs (or anyone) as they had no idea what was happening or that she had been taken to psych ward. The Resident at Mayo graduated and got her license to practice psychiatry and is in a teaching capacity at a university across the country. I found out with the help of two of daughter's medical team that this resident was doing a research paper (found on Mayo web site) on eating disorders in teen girls and using psych drugs to "treat" them and she needed a guinea pig, my daughter, to finish her (falsified /experimentation) paper on time. And research grants were also at stake. She had also made grossly false entries on daughter's medical records, including bogus diagnosing both my daughter and myself. This resident posted her "eating disorder research" on her bio page on the university web page where she is now gainfully employed, handsomely compensated. How many more children and loving families has she, and the psych program at Mayo, and the second hospital she was taken to, harmed? And going forward? Such a needless tragedy! These people are out of control. Each and every one of them needs in my opinion to be held personally accountable by subjecting them to a lawsuit involving millions of dollars in damages. They also need to be jailed for their criminal activities.